Money burning a hole in your pocket? Want to buy our stuff but can't find the links? This is the page to come to! 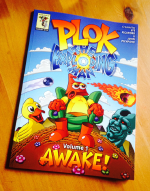 Five volumes of the Plok Comic Strip, and a colouring book, are now available to buy in paperback or ebook edtions. Head over to the Plok Shop page to find out more. You can also support the Pickford Bros' continued creation of the Plok comic strip for just $1 an episode over on Patreon. Signed prints of artwork and comics by The Pickford Bros are available to buy on their BigCartel website. Our first iOS release, Magnetic Billiards: Blueprint, is no longer available on the App Store, sorry. Naked War for PC is no longer supported, and subsciptions are no longer for sale, sorry.